The archaeological knowledge of the Euganean thermal area still remains partially incomplete, since most of the researches undertaken were related to occasional interventions, linked to the disordered and sometimes disrespectful building expansion which the area experienced especially after the Second World War. This urban explosion was due to the exploitation of the hydrotherapic resources of the area. 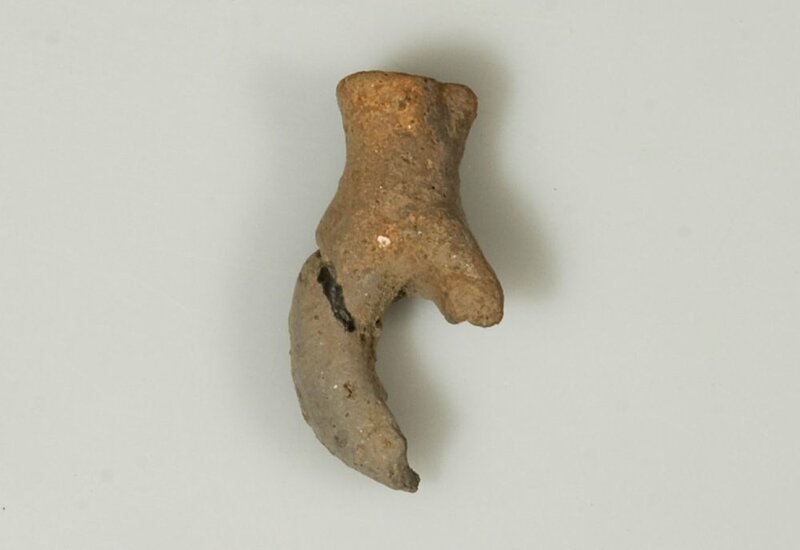 Yet the excavations were numerous over the centuries, just as the attempts of interpretive synthesis, even if they were inevitably affected in their methodologies by the cultural climate in which they were undertaken. The steps that led to the reading and reconstruction of the settlement dynamics of the area are numerous, starting from 1700. At that time, a renewed focus on the medical aspects of Euganean thermal baths turned the attention on the historical events in that territory. A series of excavations were thus undertaken by the Marquises Dondi dell’Orologio in their properties located in the modern area of Montegrotto Terme. The treatise “De’ bagni di Abano” by Salvatore Mandruzzato, that summarized the archaeological knowledge on the Euganean basin between the late eighteenth and early nineteenth century and comprised a map and some designs, still remains of great value. 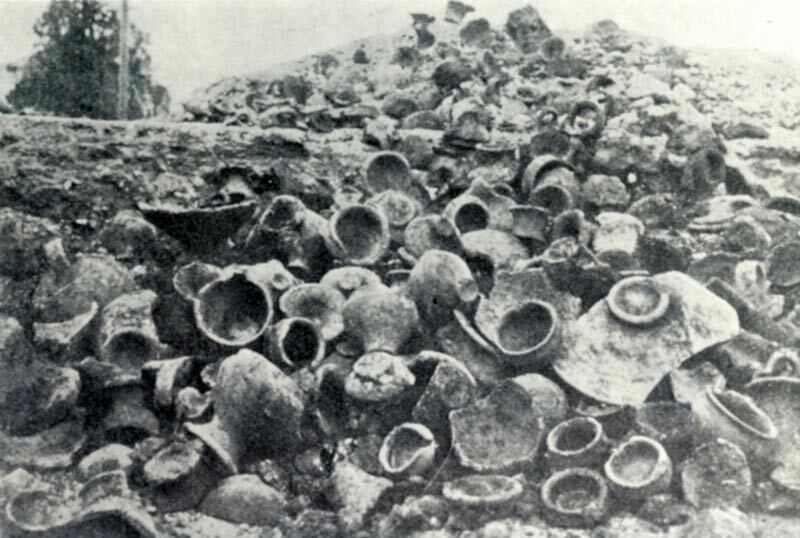 In the nineteenth century the interest of scholars moved towards Este, following the major discoveries of the Iron Age necropolis of the Veneti population, while the finds in the Euganean area were generally random and related to works of construction. Among these, the discovery of the sanctuary in the area between Monte Castello and S. Pietro in Montagnon hill was of great importance. 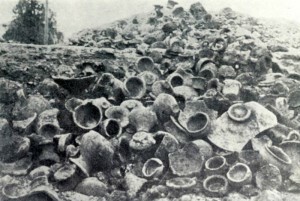 In the twentieth century the finds intensified, but mostly remained in the context of occasional works, with little regard for the historical reconstruction of the area. In the 50s planned excavations (and particularly those in the modern archaeological area of Via degli Scavi) and some attempts of interpretive synthesis, such as the work of Luciano Lazzaro, were first started. In antiquarian studies between fifteenth and seventeenth century, like those of Ongarello, Pignoria and Orsato related to Padua and its territory, archaeological news on the Euganean basin can be found. However a real scientific interest for the reconstruction of the past of this area arose in the eighteenth century and especially in 1769, when a special chair addressed at the historical investigation of the district was established at the University of Padua. The initiative was part of a renewed interest in the medical and therapeutic aspects of the Euganean thermal baths that swept throughout the eighteenth century and which led to the edition of important treaties, such as those of the Paduan doctors and scientists Domenico Vandelli (1761) and Salvatore Mandruzzato (1789-1804). It is in particular the work in three volumes of the latter which is still of great interest in the historical studies of the Euganean basin, as it synthesizes all the information about the archaeological discoveries made until that moment in the area. 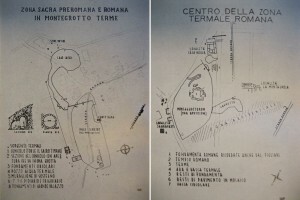 As for Montegrotto Terme, the data are also displayed in a map and in a detailed drawing included in the third volume. 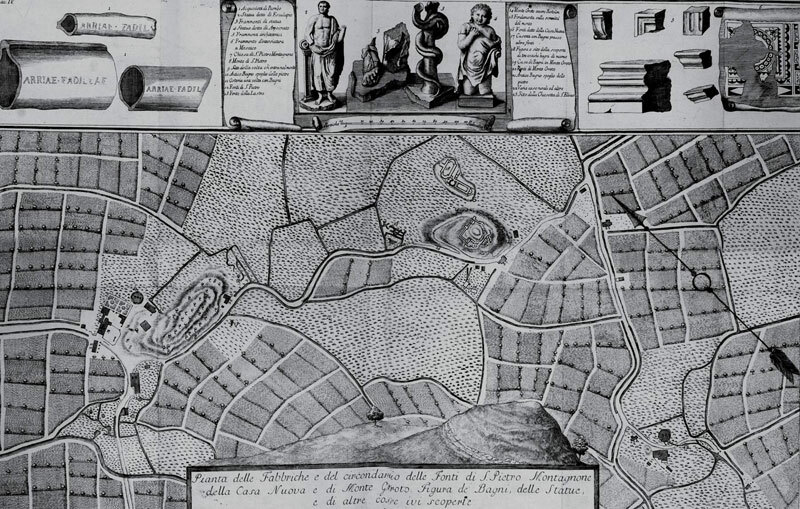 The map shows the area of the town in its physical and agrarian conformation, locates archaeological finds and supplements them with designs of some sculptural elements, a mosaic fragment and some stamped leaden pipes brought to light during the excavations of Marquis Giovanni Antonio Dondi dell’Orologio in the properties of the family, and in particular in the area at the foot of the Bortolone hill. 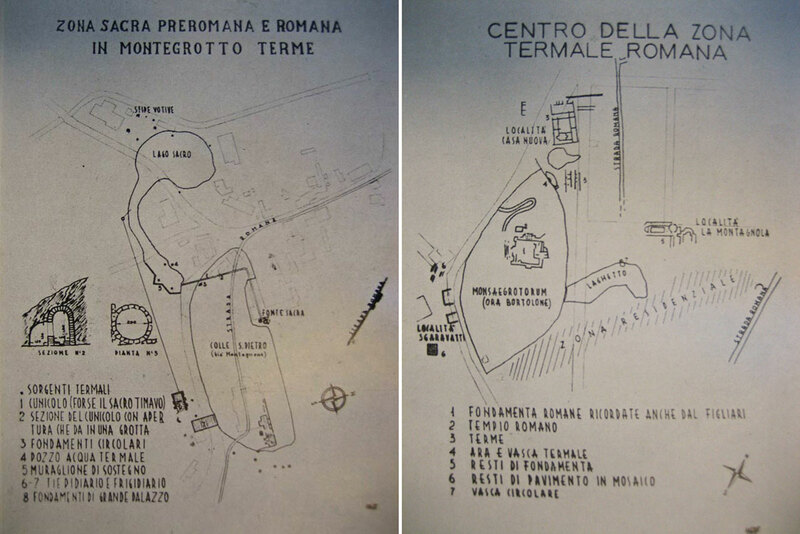 The drawing reproduces the plan of the three thermal baths which are still partially visible in the archaeological area of Via degli Scavi. The investigations of Dondi dell’Orologio in Montegrotto were stimulated by random finds of “tiles with factory stamps”, architectural elements and also an intact marble statue. This last artwork is described in a booklet of the “educated Venetian librarian” Girolamo Zanetti who recognized in the statue the god Aesculapius (1766). Based on this identification, the structures that came to light in 1780 as part of an expansion of the excavations of the Dondi dell’Orologio on top of the Bortolone hill were interpreted as a cultual building dedicated to this deity. 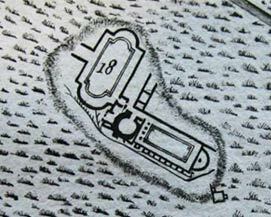 The plan of the discovery is represented in an anonymous drawing of 1780 preserved in the Public Library of Padua (RIP XXIX, 5220). The archaeological observations on the Euganean thermal area by Mandruzzato are completed by the second volume of Jacopo Filiasi (1794-1796), who also recovers data form ancient literary sources. However, he often falls into poorly philologically correct readings and fanciful interpretations. Throughout the nineteenth century and well into the twentieth century the fervor of the studies on the thermal Euganean area experienced a significant setback compared to the previous century. Archaeological finds were numerous as a result of construction or agricultural works, but they were characterized by randomness and often clandestinity, and thus provided with partial and incomplete information.. 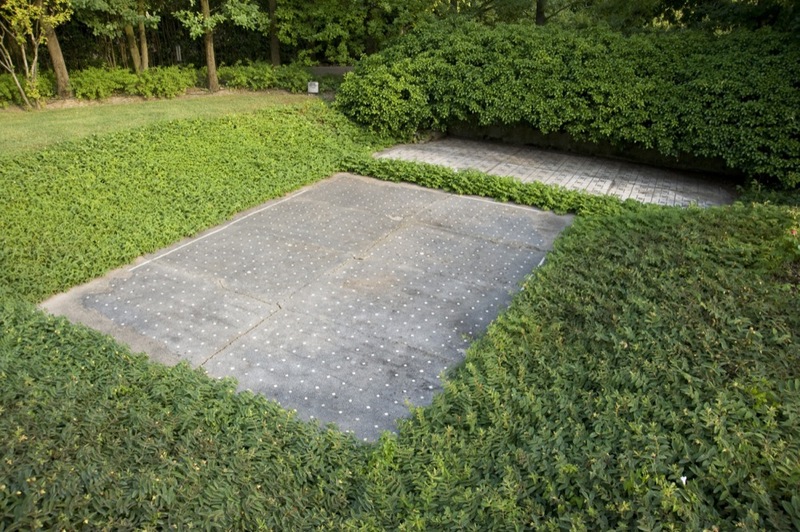 In the town of Montegrotto, in 1827 the “Austrian Commission for the ancient monuments of the thermal area” discovered a group of mosaic floors probably related to a residential building in Trieste property. These finds were illustrated by Candeo in panel preserved in the Public Library of Padua, where they are drawn with other structures that emerged in the same years (RIP XXIX, 5221). In 1863 two plunge-pools were also found in the property of Alessandro Sette (they were measured in plan and section by Ing. Giuseppe Monti and the data were recorded in two panels now in the Public Library of Padua: RIP XXIX, 5218 and 5219). 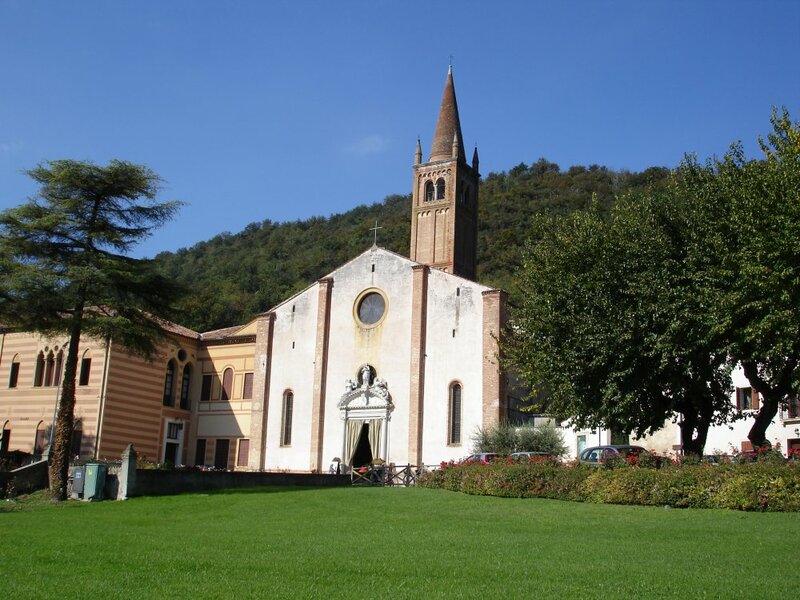 As for the town of Abano Terme, an important summary of the findings in the nineteenth century can be found in Luigi Busato’s work (1881), which constitutes a milestone in the history of Abano studies, although partially distorted by an excessive local pride. The absence in that historical period of planned excavations in the thermal basin is linked to the shift of the historical interests towards Este where, in the second half of the century, rich Iron Age tombs of the Veneti population were frequently found thanks to the strong efforts of scholars such as Alessandro Prosdocimi and Gherardo Ghirardini and the intelligent fieldwork of Alfonso Alfonsi. Furthermore, in the late nineteenth century the attention of the scholars was attracted by the identification of the prehistoric settlements which were emerging in Lozzo Atestino, Arquà Petrarca and Marendole with the systematic excavations conducted by the engineer Federico Cordenons. He also returned attention to “Abano, which, although cannot compete in any way by variety and richness with Este, nevertheless has some importance, at least for its votive nature”. In 1897, in the journal “Bollettino di Paletnologia Italiana” number XXIII, the Cordenons actually gave notice of what was perhaps the most significant of the random findings in the area . A “real votive deposit” with clay and bronze materials was in fact discovered around 1872 in a private field property of Pietro Scapin, located in the area between Monte Castello and the hill of S. Pietro Montagnon, where the modern Terme Preistoriche Hotel is located. 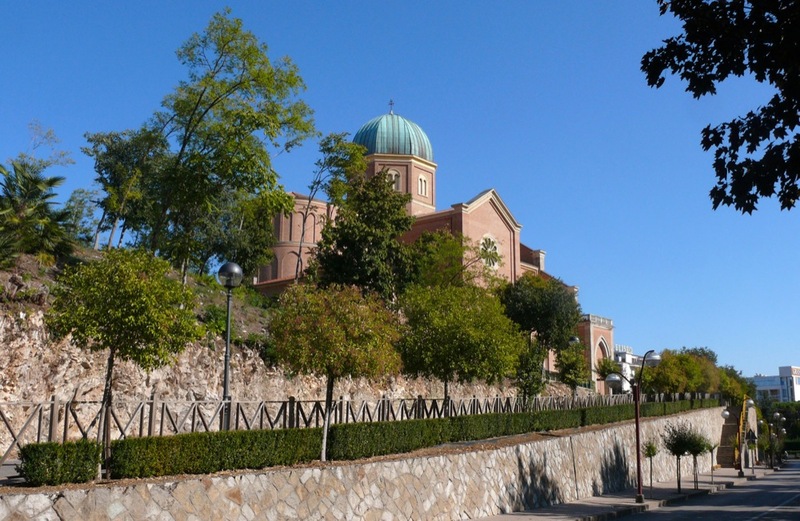 Following targeted surveys conducted by the same Cordenons in 1892 and by Pellegrini and Alfonsi in 1911, the sacred character of the area became clear and the place was recognized as a sanctuary developed around a hot spring. 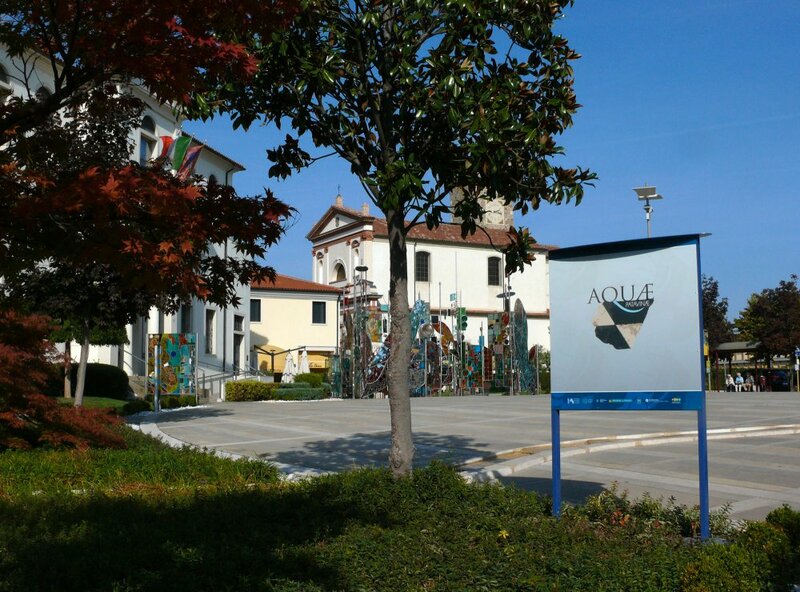 During the twentieth century, the Euganean area was the center of a whole new series of other occasional discoveries, mainly with regard to the numerous construction projects linked to the opening of new therapeutic establishments. Investigations were also undertaken for the purpose of understanding and enhancing the area. The random findings in Montegrotto Terme included a luxurious Roman villa unearthed in 1931 and in 1970 along Via S. Mauro and another probable residential building emerged in 1948 on the hill of San Pietro Montagnon during the construction of the parish church. As for Abano Terme, in 1951 a deposit of fine pottery was discovered during the construction of the Due Torri-Morosini hotel, not far from Montirone hill. From the middle of the twentieth century, programmed excavations were conducted on several occasions in the modern Via degli Scavi, already subject, as mentioned, of eighteenth-century researches.. In the middle of the twentieth century two works of synthesis on the antiquity of the Euganean basin also saw the light: an educational text by Cesira Gasparotto (1954) and a small volume on Montegrotto general history by Galliano Miglioraro, previous mayor of the town (1956). This latter work, although little critically deepened, includes two plans of some interest, as they form a kind of archaeological map summarizing all the data known up to that moment. All information collected in this and in the previous works were resumed and specified in the works of Luciano Lazzaro, who devoted much of his energetic and passionate research activity to this area where he was born and where he lived. Lazzaro’s analysis inevitably left out a very interesting site, which was accidentally identified in Montegrotto in via Neroniana few years later and that was subsequently subject to various excavations. 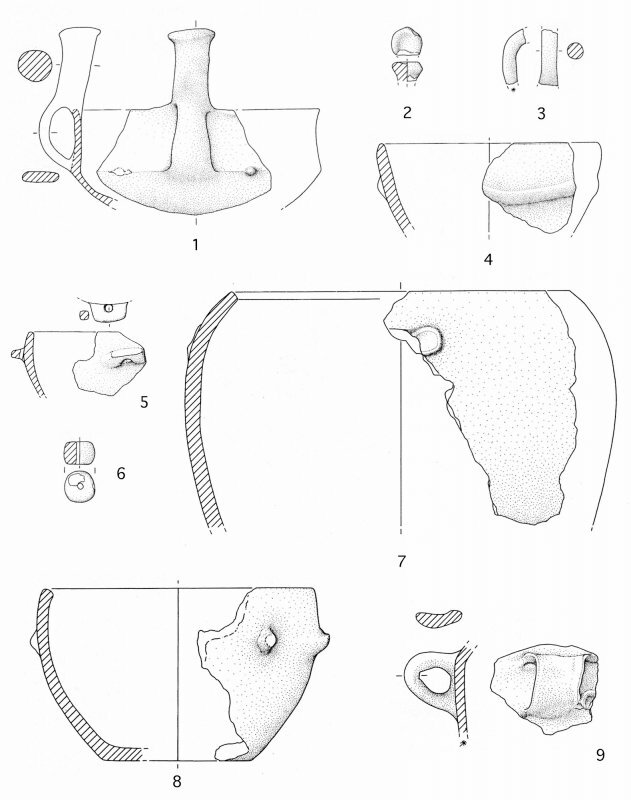 This important discovery was published for the first time in 1997, in a volume promoted and organized by the Archaeological Superintendence, which gave the latest archaeological synthesis on the studies of the thermal Euganean area starting, as seen, from the eighteenth century (Delle antiche terme 1997).